A non-sports/non-work related getaway? For us? No way! But, WAY! Jill found a great hotel in Brooklyn, with easy access to the 'City', so we decided to get out of dodge for a couple of days! Headed out on Tuesday, arriving in Brooklyn around one in the afternoon. We stayed at the Hotel Le Jolie, a very nice boutique type hotel at 235 Meeker Ave. This was the perfect location, being only three blocks from the subway station, and well situated in the Williamsburg neighborhood of Brooklyn. After getting situated at the hotel, we truged out in the snow in search of some lunch, and Jill found a great place for us to eat! Motorino Pizza, at the corner of Graham and Devoe Streets, was the perfect place for a bite to eat, and to warm up a bit. We shared a mixed green salad, as well as a margherita DOC pizza, both of which were very good! With lunch finished, we walked up and took a couple of subway trains to put us in the Park Slope area. We wandered through some stores here, and stopped at Cake Man Raven to pick up a great late night snack! Red velvet cake! We also saw the 'area' where the Barclay's Arena was to be built - will be interesting to see if the next time we are there it's actually a building! A couple of subway rides later we arrived back at the hotel. Tuesday night was another culinary winner! 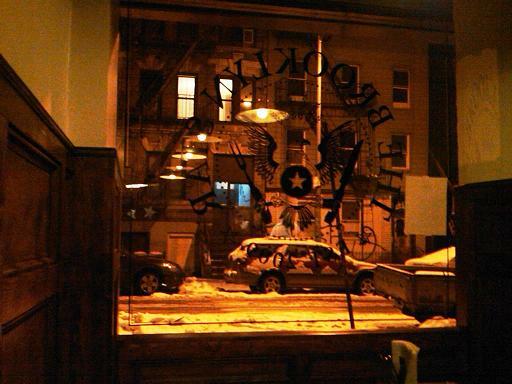 We had dinner at the Brooklyn Star, on Havemeyer Street, a short walk from the hotel. Editors note: as I write this travelogue entry, we found that a half hour after leaving the Brooklyn Star, the restaurant caught fire and was devastated. Ironically, we had gone back to the hotel and while Jill was doing some school work, I was commenting about how many fire engines were racing by there! For starters, we had corn bread with bacon and jalapeno. For dinner, Jill had BBQ catfish, marinated beets, and pickled smoked onion rings, and I had country fried steak, mashed potatoes, and hot slaw. To drink, Jill had some iced tea and I had (when in Rome!) a couple of Brooklyn Pilsners. We were a bit full, so we opted out of dessert (which, as you can see above, was probably a good thing!). We were both a bit tired after dinner, plus Jill had a bit of school work to grade, so we went back to the hotel afterwards. Really cool picture that Jill took; window was broken out about an hour later! On Wednesday, we decided to spend the day adding a bit of 'culture' to our lives! LOL! So, we began by going to the Museum of Modern Art (MOMA) first thing in the morning. When we got there, we found a line for tickets that was a half a New York City block long! It moved along rather quickly though, and we were soon inside. The main reason for visiting MOMA was the Tim Burton exhibit that they had there. It proved to be so popular that there was a timed entrance to it. Our 'time' was 2:00, so we wandered through the rest of MOMA, taking a look at the Monet Water Lillies room, as well as the other artwork there. Needing to waste a bit of time, and being a bit hungry, we went over to Rosie O'Grady's for lunch. It was adequate, but probably the least of the meals we had on this trip. After lunch we went back to MOMA and went through the Tim Burton exhibit, which proved to be both worth the wait and the money we spent to get in! Looking for a late afternoon snack, we went to Pinkberry on 55th for some yummy frozen yogurt before heading back to the hotel to change. Wednesday night would take Jill and I to our second Broadway production since we've been together, our first play. This one was called "A Behanding in Spokane", and was at the Gerald Schoenfeld Theater. One of the reasons we were drawn to this production, beyond it's 'dark comedy' moniker, was the fact that Mr. 'More Cowbell' himself, Christopher Walkin, was starring in the play. Beforehand, we went to the Hilton Times Square for a couple of drinks. We had good seats for the play, balcony front row to the right of the stage. The play didn't disappoint, and we were glad that we were able to see it - it had a limited run on Broadway, and would only be there for about 16 weeks. Dinner after the play was at Marseille on 9th Ave at the corner of 44th. Another great find by Jill! We shared a goat cheese tarte as an appetizer; Jill had the Bouillabaisse as her entree, and I had the steak frites; for dessert, I had the creme brulee and Jill had the espresso parfait. For drinks, I had a Schneider Weisse Hefe-Weizen, and Jill had a pinot grigio. We hopped a couple of subway trains after dinner and made our way back to Brooklyn. Thursday morning would bring the end of our quick excursion to Brooklyn. We slept in a bit, then got up and checked out of the hotel. Before we left, we wanted to grab a bite to eat, and with Mexican on the mind we searched out a little place back over in Manhattan. Paquito's on First Ave looked like a little whole in the wall, but they served up some great authentic food! We shared a half pitcher of Sangria, and Jill had chicken enchiladas with green sauce, while I had a dish called 'pollo pipan verde', chicken with an awesome pumpkin seed and tomatillo sauce on it! Wow! After lunch we stopped at the Birdbath Bakery for a couple of snacks for the ride home before jumping back on the "L" train to Brooklyn. In the car and back to Binghamton from there, arriving home around 4:30. At the Schoenfeld Theatre we sat right mezzanine row A, seats 14 & 16.